How Safe is Medical Marijuana in Relieving Chronic Pain? How do you spell relief? Millions of people turn to pain medications, both over the counter and prescription, to bring a fast end to their soreness, aches, and, in some cases, agony. And let’s face it: On days when your arthritis flares, ibuprofen may be the only thing that keeps you moving. Canadians are lucky to have so many medications that help with pain. But many pills are trade-offs; they help with the pain but they also pose the risk of unwanted side-effects. The twenty-first-century thinking on painkillers is that they are a part of a pain-management program in which self-care, physical therapy, and complementary therapies are just as important. Dr. Mark Ware is a world-renowned pain specialist and director of clinical research at the Alan Edwards Pain Management Unit of the McGill University Health Centre (MUHC). Dr. Ware, who is also an associate professor of Family Medicine and Anesthesia at McGill University and a scientist in the Brain Repair and Integrative Neuroscience (BRaIN) Program of the Research Institute of the MUHC (RI-MUHC), has been studying the use, safety and effectiveness of medical cannabis for the last 16 years. He is also involved in population-based studies on the impact of pain and the evaluation of complementary therapies in pain and symptom management. Dr. Ware, and a team of researchers from across Canada, have now completed the “largest study of the long term safety of medical cannabis use by patients suffering from chronic pain ever conducted.” The study concluded that patients who used cannabis daily for one year did not suffer any more serious adverse effects than patients who did not take cannabis. The study took place across Canada and involved over 430 patients suffering from chronic pain, half of which took cannabis, the other half serving as controls. The study followed 215 adults with chronic non-cancer pain who used medical marijuana and compared them to a control group of 216 chronic pain sufferers who were not cannabis users. In both groups, conventional pain therapies had not been effective. The cannabis group received dried marijuana from a licensed producer, which contained 12.5 per cent of the active ingredient tetrahydrocannabinol, or THC. 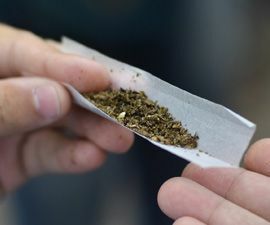 On average, patients used about 2.5 grams per day, in line with recommendations under Health Canada’s Marihuana for Medical Purposes Regulations. The drug was smoked, vaporized or ingested as an edible. The study was published online in The Journal of Pain.